Providing excellent playability and higher bounce, the Wilson Staff squash balls are a one blue dot option for beginner players who just started to adjust to the game and want to learn the basics, as well as develop abilities and precision with long and effortless rallies. The balls are approved by World Squash Federation to ensure quality play and high standards, plus they arrive in a pack of two. for submitting product information about Wilson Staff Blue Dot Squash Balls - Pack of 2 We aim to answer all questions within 2-3 days. for submitting product information about Wilson Staff Blue Dot Squash Balls - Pack of 2. We aim to answer all questions within 2-3 days. If you provided your name and email address, we will email you as soon as the answer is published. 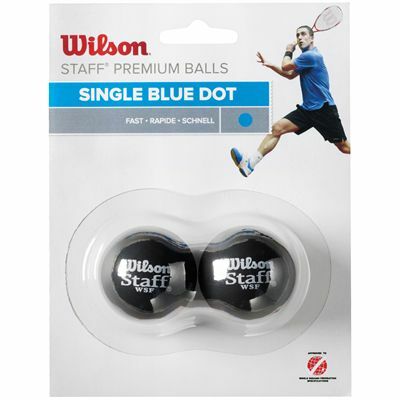 for submitting product review about Wilson Staff Blue Dot Squash Balls - Pack of 2.